Ninja Kiwi just released its latest naval action RPG, Fortress Destroyer, and it's looking promising. Choose a ship and start building your offensive capabilities to protect the world, post devastation, from the evil Blackwater. In 2063, vast ice shelves in western Antarctica broke free, crushing coastal cities beneath cataclysmic waves, overwhelming nuclear failsafes, and plunging the world into disease, mutation, economic collapse, and regional conflict. Governments crumbled, and in 2065, Aiden Black, head of the world's largest naval military contractor, Blackwater Enterprises, unleashed his stockpiled fleets and seized control of the seas. You are a captain in the New Coastal Alliance, a coalition of surviving national and private fleets held together by the need to confront Blackwater. 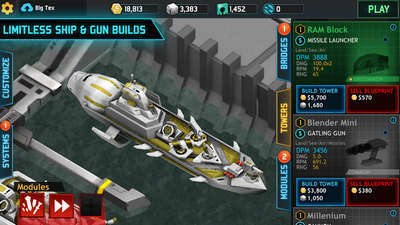 You must arm your ship, collect valuable Blueprints to build your strength, and assemble a fleet of warships mighty enough to challenge Blackwater and allow our world to rebuild. 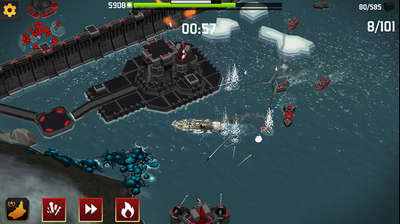 • If you're into ships and sea warfare then download Windward, a game in which you build your own crew and ships, sail into the open seas, and engage in deep sea combat. - 3 ship classes, fill multiple gun slots with powerful weapons, and add Modules to get new abilities. Take your custom ship build into one of 15 missions, and unleash pure havoc. Earn resources and precious Blueprints with each victory, upgrade your ship, and build a fleet of up to 15 ships to wrest command of the seas away from your relentless enemy. - Forget about slow ship simulations you've seen before - this is smooth, one-touch driving with the ability to dodge incoming fire, auto-target enemies, and line up nitro boosts for awesome ram combos. - Navigate past enemy turrets and fortifications to crush enemy-spawning factories. Then face off against huge armored boss ships. - 15 different ship types, 16 Bridges, 100+ weapons, and 75+ modules allow you to craft an incredible array of powerful ships. Use Fleet Squadron to call in two of your other ships to tackle tough objectives, or send other ships off on timed missions to come back with critical resources to help you grow even stronger.